A fresh application of mulch is a quick way to spruce up your landscape. The proper mulching or Pine Straw application to your flower, shrubbery, and landscape bedding will not only give your property a crisp, clean and manicured look, but it will also drastically reduce the amount of time spent weeding, watering and fighting pests. Mulching and Pine Straw also help with erosion control as well as it keeps dirt from splashing up on your flowers, home and hardscape features when it rains. We can help you decide the amount of mulch your landscape needs. 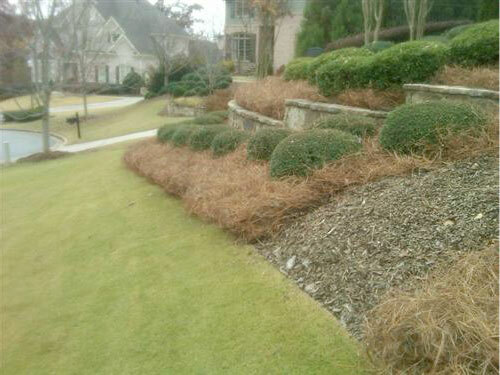 Best of all, we will install the Pine Straw or mulch for you.